There is a very common condition that occurs to millions of middle age and older adults where the nerves on the bottom (plantar) aspect of the foot become damaged. These symptoms can range from simply cold toes, to occasional numbness or tingling, to sharp shooting pain. Many physicians attribute this to diabetic neuropathy, but there is a more common cause linked to faulty foot alignment. How can misaligned feet cause plantar neuropathy? Misaligned feet is linked to both a compression and elongating of the primary nerve to supplies the bottom of the foot with nerve sensations. When your feet are aligned there is a normal amount of pressure and elongation of the nerve. When the ankle bone loses its normal stability and alignment on the heel bone there will instantly be a compression force and elongation on the nerve at a critical area to the inner arch. The first form of treatment for plantar neuropathy has to be the realignment and stabilization of the ankle and heel bones. Failure to realign this most important joint complex will result in progression of the nerve disease. External measures are not able to realign the hindfoot bones, and most reconstructive surgery is too aggressive for most patients. HyProCure can instantly realign and stabilize the hindfoot and is the only form of treatment shown to decrease the compressive and elongation forces acting on the posterior tibial nerve. 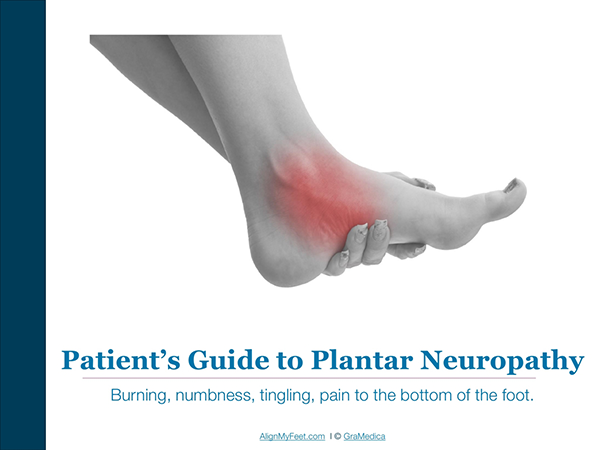 Get Your Free Patient’s Guide to Plantar Neuropathy Today!